Patients and visitors with a disability should find it quicker and easier to park for free at Southmead Hospital. Volunteers will now be on hand to help official blue badge holders to register at the Brunel building multi-storey car park. Previously drivers needed to record their badge and vehicle registration numbers on a parking machine, but this was proving difficult. Our Move Makers, based in the main reception of the Brunel building, will be able to upload these details on a portable tablet, reducing time and worry. 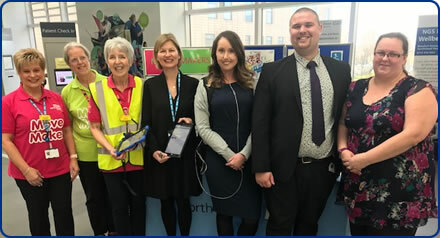 This innovation came about after Sarah Cox, a patient who regularly uses Southmead Hospital, told us of the difficulties the parking system was causing her. She then worked with our parking team and parking machine supplier to develop a tablet app and simplify the process. “This new system will reduce hassle and worry for disabled people and their families, making it easier to get to an appointment on time. Anyone parking in a disabled bay is still asked to display their blue badge clearly in the window. Free wheelchairs are available and the Move Makers can drive Brunel visitors and patients to their appointment or ward in a buggy. The Move Makers will also be able to help blue badge holders to register if they have parked in the Women and Children’s Health and Gloucester House car parks on the Southmead site. The Move Makers also have two electric wheelchairs to transfer outpatients from the Brunel building to other locations on the Southmead site. These are available from the Move Maker office on request.